The Razzons are here! Mopiranger to the rescue! All is not well in Mopiland! Invaders from far away, the Razzons, are bent on enslaving the peaceful Mopiras! 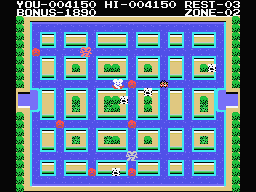 The first phase of their plan was to capture the young Moplits and lock them up in their maze-like water castles, but they didn't count on Mopiranger, the hero defender of Mopiland! 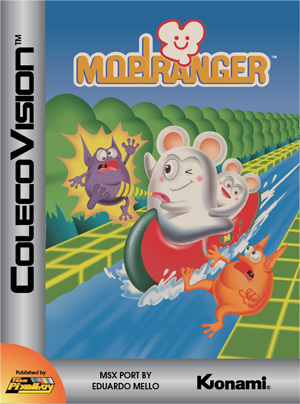 As the Mopiranger, ride your trusty canoe through the Razzon's water castles, and free the Moplits! 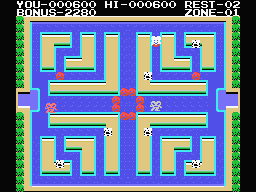 Use your Stone Beamer to turn the Razzons to stone, but be careful not to block yourself into a corner of the maze! Go, Mopiranger, Go!